Today's Astronomy Picture of the Day (click on the picture for the large version) is another great sense of astronomical scale. 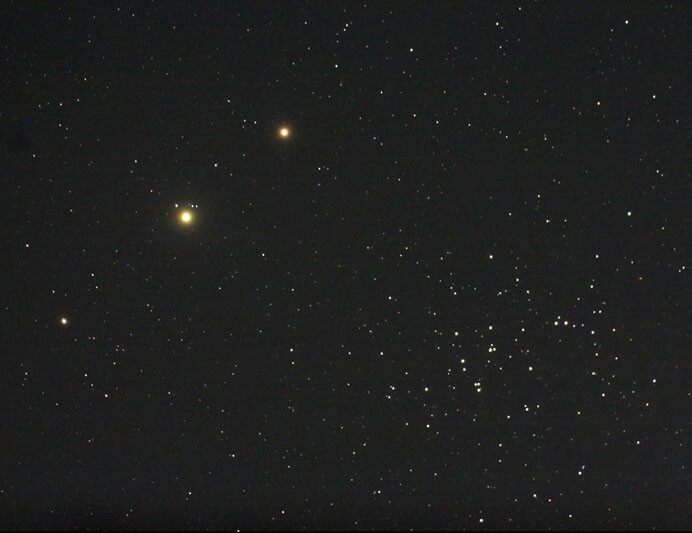 The two bright "stars" are really the planets Mars (upper right) and Saturn (lower left). At the time of the picture, Mars was about 214 million miles away, and Saturn was 920 million miles away. Saturn looks much brighter because it is much bigger, and because its rings (lost in the planet's glare) reflect a lot of light. Most of the stars belong to the Praesepe star cluster, a group of stars about 600 million years old and 580 light-years away (that is 3500 trillion miles, or sixteen million times further away than Mars! Too faint to see in this image are (at least) three quasars that I discovered in 2004. These giant black holes are over nine billion light years away, or 16 million times further than Praesepe!